Botanically, the genus Lavandula can be divided into 5 sub-generic groups. All the garden and common lavenders belong to the Stoechas and Spica groups. A number or rare species cultivated in Australia and New Zealand belong to the Pterostachys group. There are approximately 30 species. The sub-genus Spica includes L. angustifolia, L. latifolia and L. lanata, all collectively known as lavandin. 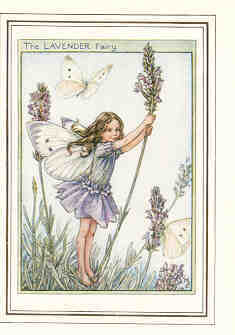 True English lavender, L. angustifolia Mill, is the species from which the essential oil used in perfumery is distilled. This species has also been known by the synonyms L. officinalis Chaix, L. vera DC, and L. spica L. The synonym L. officinalis indicates that this was the lavender specified for medicinal use. L. angustifolia isadapted to living in a dry climate and is native to the western half of the mediterranean, reaching altitudes of up to 1800 meters. It is likely that the Romans or Benedictine monks introduced it to England before the Norman conquest, and it was first recognized as a distinct form of lavender in the twelfth century by the Abbess Hildegard (AD 1098-1180) who lived near Bingen on the Rhine. It is also recognized as a separate type of lavender by the Welsh physicians of the thirteenth century who knew it as Llafant. Many garden lavenders are inter-specific hybrids between L. angustifolia and L. latifolia, and these hybrids are collectively known as 'lavandin', with the accepted nomenclature being L. x intermedia Emeric ex Boiseleur.56 This complex situation results in many incorrect names for lavandin. Several Lavandula species have been used medicinally, including L. angustifolia Mill. (syn. L. officinalis Chaix. and L. spica L.), L. stoechas, L. dentata, L. latifolia and L. pubescens Decne. Aspic, lavandin (usually refers to particular hybrids), lavender, spike lavender, true lavender. Lavender plants are aromatic evergreen sub-shrubs that grow to about 3 feet high. The plants are native to the Mediterranean region. Fresh flowering tops are collected, and the essential oil is distilled or extracted by solvent extraction.1 The plant has small blue or purple flowers. The narrow leaves are fuzzy and gray when young and turn green as they mature.2 Lavender is cultivated extensively for use as a perfume, potpourri and as an ornamental. Most species of lavender are native to the Mediterranean coastal region, but others come from islands in the Atlantic Ocean, tropical north-east Africa (Somalia) and the Indian sub-continent. Lavender is usually administered in the form of an infusion, decoction or oil and is either taken internally or applied topically for relief of neuralgia. Today, lavender oil and extracts are used as pharmaceutical fragrances and in cosmetics. Spike lavender oil is often used in soaps because it is inexpensive but of lower quality than true lavender oil. Lavandin oil, lavender absolute (an extract) and spike lavender oil are used in concentrations of up to 1.2% in perfumes.1 Small amounts (0.002% to 0.004%) of the oil are used to flavor food. Lavender is an aromatic plant that has been used in herbal medicine for centuries. It has been known to exhibit CNS depressant activity and is used for insomnia or to relieve anxiety and stress. It may also be helpful in GI disorders to reduce sugar and cholesterol levels and aid in grafting surgery. Lately, lavender compound perillyl alcohol is being studied for its promising effects in cancer prevention. Lavender has a low toxicity profile. Uses: Therapeutic: Antispasmotic, carminative, antidiabetic agent, restlessness and insect repellant. Nutritional: Food flavoring agent. May increase or potentiate the CNS depressant effects of sedative-hypnotics. Side Effects: Allergic contact dermatitis. Leung AY. Encyclopedia of Common Natural Ingredients Used in Food, Drugs and Cosmetics. J Wiley and Sons, 1980. Weiss RF. Herbal Medicine, Hippokrates Verlag, 1988. Gamez MJ, et al. Pharmazie 1987;42:706. Abulafaith HA. Econ Bot 1987;41:354. San Martin JA. Econ Bot 1983;37:216. Lamparsky, D. Lavender. Perf & Flav 1986;11(Aug-Sep):7-8, 10, 12-13, 15-20. Bisset NL. Lavandulae Floes Herbal Drugs and Phytopharmaceuticals, CRC Press, Stuttgart, Germany, 1994;292-94. Mesonero MM, et al. Boll Chim Pharm 1974;113:131. Szabolcs N, et al. Acta Pharm Hung 1985;55:49. Jones C. Herbs for Health 1998;(Jan/Feb):17. Boelens, MH. Perf & Flav 1986;11(Oct-Nov):43-54, 56,58-60, 62-63. Kustrak D, et al. Pharma Acta Helv 1975;50(11)373-78. Ikechukwu E, et al. J Chromatogr B Biomed Appl 1997;688(2):354-58. Kreis P, et al. PZ Wissenchaft 1993;138(5-6):149-55. Ognyanov I, et al. Rev Ital Ess Profumi Piante Officinali Aromi Saponi Cosmetici Aerosol 1973;9(Sep):560-64. Mizrahi I, et al. Soap, Perfumery & Cosmetics 1970;43(Jun):379-88. Djarmati S, et al. Arch Farmaciju 1987;37(5):229-33. Prager MJ, et al. Perf & Flav 1981;6(Apr-May):53-58. Agnel R, et al. Perf & Flav 1984;9(Oct-Nov):53-56. Ahmed A, et al. Revi Itali Ess Profumi Piante Officinali Aromi Saponi Cosmetici Aerosol 1980;62(Sep-Oct):293-96. Rouzet M. Lab Pharma Probl Tech 1984;32(Jun):462-66. Denny EFK. Soap, Perfumery & Cosmetics 1969;42(Oct):737-38. Nviredy S, et al. Acta Pharm Hung 1985;55(Mar):49-58. Cabo J, et al. ARS Pharmaceutica 1982;23(4):501-06. Hardy M, et al. Lancet 1995;346(Sept 9):701. Leshchinskaia I, et al. Kosm Med 1983;17(2):80-83. Dunn C, et al. J Ad Nurs 1995;21(1):34-40. Buckle J. Nurs Times 1993;89(20):32-35. Buchbauer G, et al. Z. Naturforsch 1991;46(11-12):1067-72. Lee CF, et al. Ann Physiol Anthropol 1994;13(5):281-91. Gamez MJ, et al. Pharmazie 1988,43:441. Gruncharov V. Vutr Boles 1973;12(3):90-96. Secoy DM, Smith AE. Econ Bot 1983;37:28. Jager W, et al. J Soc Cosm Chem 1992;43(Jan-Feb):49-54. Dale A, et al. J Adv Nurs 1994;19(1):89-96. Kelloff G, et al. J Cell Biochem Suppl 1996;26:1-28. Gould M. Environ Health Perspect 1997;105(Suppl)4:977-79. Mills J, et al. Cancer Res 1995;55(5):979-83. Stayrook K, et al. Carcinogenesis 1997;18(8):1655-58. Ren Z, et al. Biochem Pharmacol 1997;54(1):113-20. Hohl R, et al. Adv Exp Med Biol 1996;401:137-46. Katdare M. Cancer Lett 1997;111(1-2):141-47. He L, et al. J Nutr 1997;127(5):668-74. Stark M, et al. Cancer Lett 1995;96(1):15-21. Burke Y, et al. Lipids 1997;32(2):151-56. Reddy B, et al. Cancer Res 1997;57(3):420-25. Gould, M. J Cell Biochem Suppl 1995;22:139-44. Fulton G, et al. J Surg Res 1997;69(1):128-34. Elson C, et al. J Nutr 1994;124(5):607-14. Brandao FM. Contact Derm 1986;15(4):249-50. Rademaker M. Contact Derm 1994;31(1):58-59. Schaller M, et al. Clin & Exp Derm 1995;20(2):143-45. Guillemain J. Ann Pharm Fr 1989;47(6):337-43. Samara Botane stocks a variety of Lavendula spp. essential oil, absolutes, concretes, and related products. Use our Store Search Engine to search for them using the search term "lavandula".